Welcome to another epic Judge Dredd story lasting six months of weekly issues. Having introduced Psi Division they can now play about with prophesy. A vision of doom now clouds the city and the only saviour is a kid with a funny birthmark. Typical stuff. This is basically the Cursed Earth Saga all over again but in space. Dredd stops off at random planets, which all have some wacky theme, and plays hero. You could cut most of these side-tracks out as padding or “Future Shocks” that didn’t make it and you wouldn’t notice. It’s almost as if Wagner went on holiday and the people in the office filled in. But having said that it is a good story. We meet the Angel gang for the first time and see how villains should be done. We see the recreation of Ancient Egypt in the Cursed Earth. We also meet Judge Hershey for the first time but she is allowed precious little to do. The planet-of-the-week isn’t all bad. There is a story of a primitive alien race that is told entirely through rhyme and is possibly a reworking of the song “Ernie” as devised by Benny Hill. The jigsaw disease is a real sci-fi masterstroke and brought to life spectacularly by Bolland. We also meet the Judge Child and like Dredd we are unsure of his motives. This saviour Dredd has risked everything for disappoints him, and he must make a decision for the good of his city. A decision that will bring him into conflict with his superiors. This is real character making stuff. There is humour here. 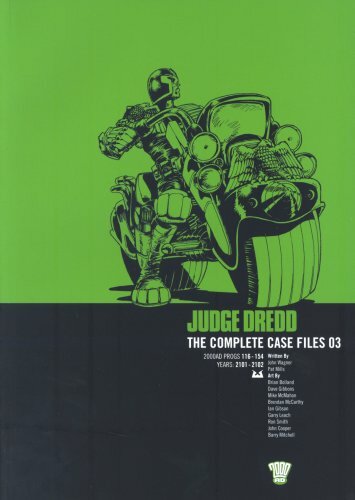 Dredd’s personal logs and his disdain for facial hair are very well done. There is also darkness with the Angel gang indulging in murder and worse still torture. This is quite a shocking theme particularly for a younger reader and I know it left a profound mark on me. It is a good story, and minus the padding, is a thrilling ride, with strong characters and a superb ending. A strong story that combines elements of The Fly or The Quatermass Experiment with a previous monster, Satanus, from the Cursed Earth saga. It is good read and Ron Smith is the perfect man for the art. Here is the birth of one of Dredd’s most iconic foes, the virtually unbeatable Judge Death. And who better to do it than Brian Bolland. Death’s look is superb. A terrifying, twisted mockery of the Judge’s uniform that tells you everything you need to know as soon as you see him. His method of killing people, in that he just makes them die, is elegant and terrifying. Unfortunately, whilst it might be time pressure or may be an artistic choice many of the panel backgrounds are black meaning we are missing out on much of Boland’s famous detail and line work. Along with Death we also get Judge Anderson. Finally, a relatable female character. One who seems to be the polar opposite of Dredd. There is a classic buddy movie in the works. Both she and Death will grow exponentially from these humble beginnings. We get Psi Division, we get Tech Judges, and we get the Hall of Heroes. It seems like Mega-city One takes a vast leap forward in just three issues. More monster of the week but with original monsters. Looks like these should have been in a straight to video 80’s horror. A good story that shows you just why you can’t be a soft Judge. Recently made into a fan-film. The evil omnipotent child theme gets reworked for the Mega-city. 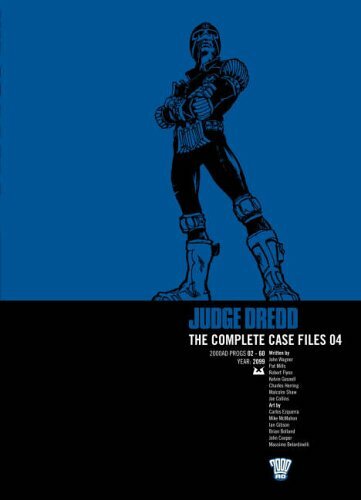 Dredd outthinks him and in a classic twist sends him off to the Academy to become a cadet. Another hard lesson in no matter how pure and virtuous you are Mega-city will screw you in the end.